Bitcoin has been in free-fall for most of the past week. Regardless, a minor recovery is underway, even amid the looming bitcoin fork and community division. The current bitcoin price is trading above $2,355.19. This is marginally lower than the weekly high of $2,425.16, and substantially below the prior monthly high of $2.789, which was realized almost 4 weeks ago, on June 21. Volume on Bitstamp has been steadily increasing since then; the preceding trade range has proven beneficial for price discovery, although at the expense of early buyers. Strong support levels have been established at the former (now invalidated) June monthly low of $2,119.45, the $1,847.84 support below it, and at the new weekly low of $1,830 respectively. A multitude of intersecting trend lines point to several resistance levels above $2,291.10, $2,365.53 and $2,424.20. 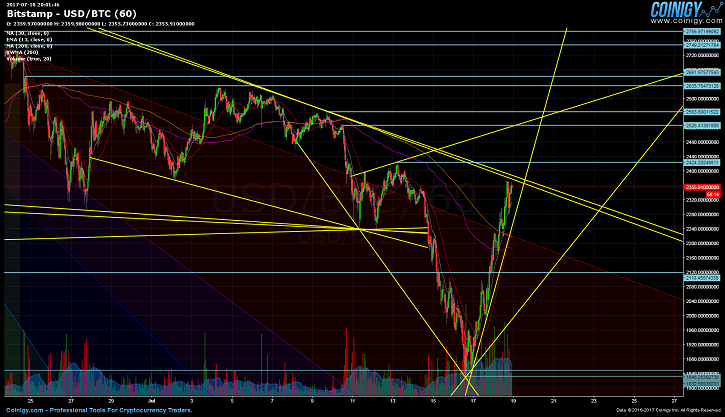 Similarly, $2,239.19 is also very interesting, due to a rather striking overlap of five different trend lines. This may end up being a key rally and swing point for any future potential sideway action, leading up to the next weekend. Fibonacci levels before the $2,980 all-time high, appear to line up reasonably well with certain support and resistance levels. 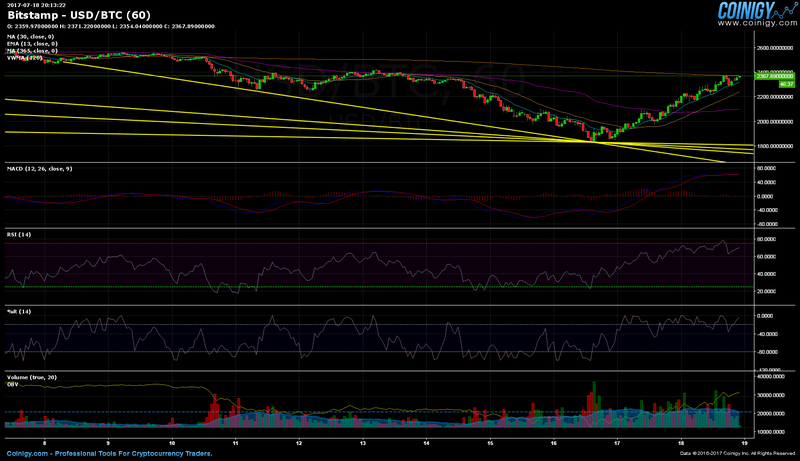 Furthermore, the 0.236 fib is quite closely aligned as well, practically to a fault with the $2,119.45 support. We are likewise nearing the 0.5 fib at $2,415.72, a breakthrough should confirm strong bullish continuation. The 0.618 fib ($2,415.72) after that, is also rather appropriately sandwiched between resistances at $2,563.69 and $2,526.41. There are two trend lines that are overlapping in this trading range too, further cementing the importance of this fib level. Lastly, there is the 0.786 fib ($2,739.49) as an extreme price point that should be watched, in case the bitcoin split ends up being a bullish event or is perceived as one moving forward. Trading has continued above both the 200-day and 30-day moving averages, with the 30-day MA crossing lightly over the 200 MA. All are strong signals of further bullish tendencies and generally positive sentiment. The 200-day volume weighted MA appears to be echoing the basic 200-day MA, albeit at a somewhat lower level. Bollinger bands have remained stable; they do not seem to be noticeably tightening, although price is considerably clasping and sticking to the upper bands. 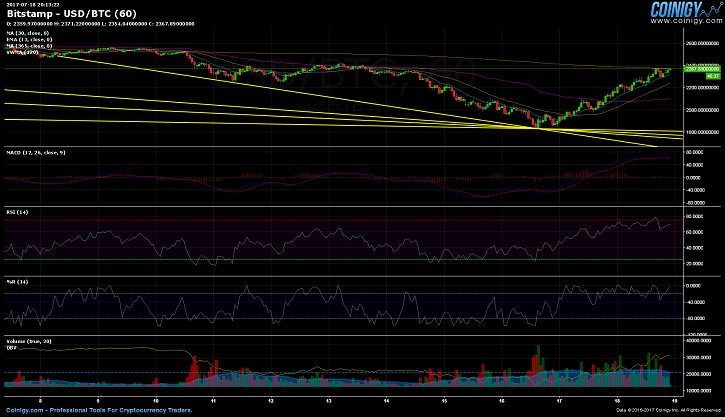 RSI looks to be oversold at the moment, but seems to be following the existing price trend and overall market movement. No lasting or substantial divergence with the Williams %R indicator, which is also mirroring RSI performance for now. The same is true for the MACD, no immediate or obvious divergence in relation to the total market trading or price fluctuations. OBV is also rising steadily along with the gradually increasing trading volume. Bitstamp’s US dollar/bitcoin pair reached a new weekly low on July 16 at $1,830 (GMT 10:00). It was the beginning of an intense move up that has currently stopped short of $2,400, slightly below the current weekly high of $2,425.16, which is in all likelihood, going to be breached in the coming hours.